Abondance et distribution spatial du microplastique neustonique en mer de Ligure. Présentation par Maria Louisa Pedrotti (LOV)*Observatoire de Villefranche sur Mer- Barcelone 2014. The 2nd International Ocean Research Conference (IORC) is an opportunity for the scientific community to come together to plan the coming decade of international collaboration in marine science and technology, with a view to improving ocean governance. The inaugural IORC was held in June 2005, when the Intergovernmental Oceanographic Commission of UNESCO (IOC-UNESCO), together with The Oceanography Society (TOS), brought attendees together to discuss expected developments in marine sciences in the decade that followed. Now, almost ten years later, the same institutions are convening the 2nd IORC to review progress made in ocean science in the last twenty years, and plan ahead in light of important policy developments such as The Future We Want (UNCSD Rio+20) and Future Earth. 3. Laboratoire d’Ingénierie des Matériaux de Bretagne, Université de Bretagne-Sud, Lorient, France. 4. Expédition MED, Questembert, France. Microplastic dynamics: Our results suggest that plastic fragments are widespread in the Ligurian Sea. 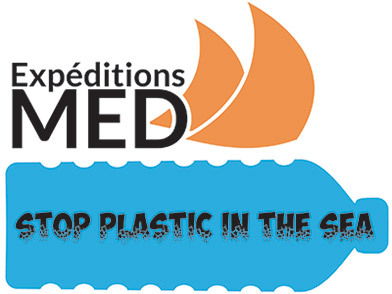 Microplastics were present in all Manta tows, varying from 11900 to 578000 plastic debris per km2 near Nice town. The average abundance of microplastics found in Ligurian Sea is higher than in Sardinian Sea with levels approximately seven times higher in the samples from the same survey in both sites (Fossi et al. 2012). The highest abundance is of the same order of magnitude as that found in the North Pacific Gyre. Marine debris has been defined as any manufactured or processed solid waste material that enters the marine environment from any source (Coe and Rogers, 1997). While plastics constitute a lower percentage of discarded waste, they are the most important part of marine litter, comprising sometimes up to 100% for floating items. Plastics have been considered an environmental and pollution threat to the marine environment whose importance will increase through the 21stcentury. In Mediterranean Sea more than 70% of plastic litter comes from land-based sources. Once in the marine environment debris may remain for many years. The Mediterranean Sea is one of the most affected by floating plastic debris however scientific investigation on the impact of microplastic is recent and results beginning to emerge. Here we report a study on the abundance, size and spatio-temporal distribution of microplastic and zooplankton carried out in summer 2013 in the Ligurian Sea. Surface floating microplastics abundance and area per square kilometer were calculated and compared to the size distribution and mean spatial trends of the neustonic plankton. 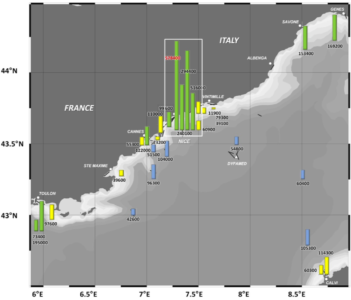 Surface floating plastic fragments and neustonic plankton were collected in July and August 2013 in the Ligurian sea (NW Mediterranean sea) in the framework of the participative science activities of Expedition MED association. Samples were collected using a Manta trawl net with 333μm mesh size (A). Back to lab, plastic particles and zooplankton were enumerated, sorted and measured by digital imaging analysis using a data acquisition system and the ZooScan (Gorsky et al, 2010.) (B-C). Fourier transform infrared spectroscopy (FTIR) and Thermogravimetric analysis (TGA) were used to specify absorption bands of plastic fragments and characterize microplastic particles. Partager la publication "One planet one ocean « Barcelone 2014 »"